Have you been wanting a kayak? 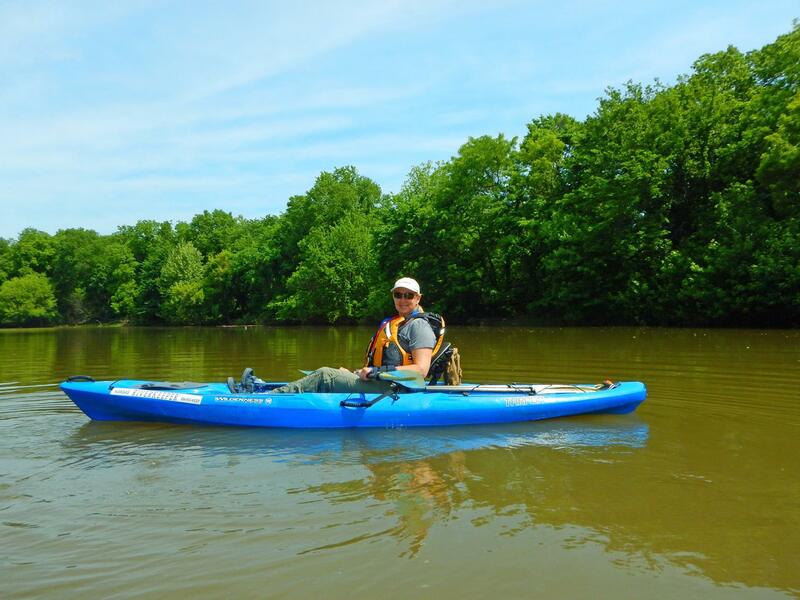 You can participate in a “Members Only” Raffle for a Wilderness Systems Tarpon 120 sit-on-top kayak (value of $920 donated by Sunflower Outdoors & the Friends of the Kaw Board)! If you aren’t a Friends of the Kaw member you can join for $15 and then buy as many $10 raffle tickets as you want. The raffle will be held in conjunction with the Wild & Scenic Film Festival – the drawing will take place at the finale of the Liberty Hall event. You DO NOT have to be present to win! Buy your tickets at the Topeka Green Fair or at either film festival. Tickets available at the box offices or online! Click here for more information! Thanks to our event sponsors: Westar Green Team, Country Club Trust Company, Kansas Wildlife Federation, Kansas Land Trust, Kansas Canoe and Kayak Association and Jayhawk Audubon. Courtesy of the Westar Green Team with RSVP to 785 312 7200 or contact Laura. Friends of the Kaw has lots of opportunities to get on the river this spring and summer. Many of the floats are paid for by grants so boat rental is free on a first come, first serve basis – participants must RSVP. For educational floats scheduled by specific groups, any boats not used are available for the public to rent. RSVPs can be made two weeks before the float date. Folks with there own boats are welcome to join any float but should RSVP to Dawn (our new Kansas Riverkeeper) in case there are last minute changes. Sunday, May 3 – Cleanup Float from Lawrence to Eudora from 1 to 6:30pm. Meet at the 8th Street Access Ramp. We will provide 5 canoes and 5 double kayaks at no cost on a first come, first serve basis but participants MUST RSVP with Dawn or at 785 312 7200. We will provide transportation to take participants back to Lawrence after the float. This is an activity of our Douglas County Natural and Cultural Heritage Grant. Saturday, May 9 from Cedar Creek to Edwardsville from 8:30am to 4pm. We will provide 5 canoes and 5 double kayaks at no cost on a first come, first serve basis but participants MUST RSVP with Dawn or at 785 312 7200. This is an activity of our Johnson County Stormwater Grant. Saturday, May 30 – Konza Rotary Float in the Manhattan area from 10am to 4pm. We will make the decision to float either Ogden to Manhattan, Manhattan to St. George or St. George to Wamego two days before the float depending on the predicited wind conditions. Contact Dawn to inquire about available boats for this float after May 16 or for more information. Saturday, June 6 – Cleanup Float from De Soto to Cedar Creek from 10am to 2:30pm. We will provide 5 canoes and 5 double kayaks at no cost on a first come, first serve basis but participants MUST RSVP with Dawn or at 785 312 7200. This is an activity of our Johnson County Stormwater Grant. Sunday, June 7 – Shawnee Mission Unitarian Fellowship float from De Soto to Cedar Creek from 1 to 5pm. Contact Dawn to inquire about available boat rentals for this float after May 24 or for more information. Friday, July 3 – Mennonite Conference float from De Soto to Cedar Creek from 2 to 5:30pm. Contact Dawn to inquire about available boat rentals for this float after June 19 or for more information. Saturday, July 11 – Cleanup Float from De Soto to Cedar Creek from 10am to 2:30pm. We will provide 5 canoes and 5 double kayaks at no cost on a first come first serve basis but participants MUST RSVP with Dawn or at 785 312 7200. This is an activity of our Johnson County Stormwater Grant.